Upon receiving a brand new violin from the internet or local retail store, chances are you need to set or move the bridge in the right location and position and tune your violin up from almost or complete loose. 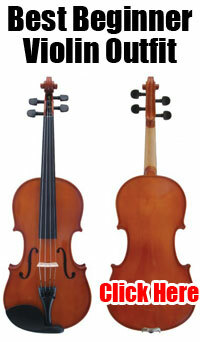 Learning to easily set up a violin with loose or new strings will make all kind of jobs much easier. Don’t be afraid to work on your instrument. The more you do it the easier it becomes. When changing a whole set of strings, simply loosen, remove, change and re-tune one string at a time. Arrange a stable working surface with a soft cover such as a large towel. Make sure the center of the bridges feet line up with the inside f-hole notches. While looking over the violin, insure that the strings are centered over the fingerboard by lifting and sliding the bridge to the right or left accordingly. Constantly check that the bridge is not leaning too far forward or backwards. Keeping the bridge at a slight back angle will insure that the strings do not pull the bridge over and even risk snapping. Tune each string one by one while controlling the angle of the bridge. Tightening one string will change the pitch of another requiring you to tune over and over between the different strings. Remember to frequently check the bridges angle.